The above example was printed in the first issue of Old Cardboard Magazine and we have continued the section with each issue since that time. See Old Cardboard's Article Index for an index to all of the many dozens of vintage collectors that have been profiled in this section of the magazine. From the Article Index search page, select Type = Dugout, then "Refresh.". 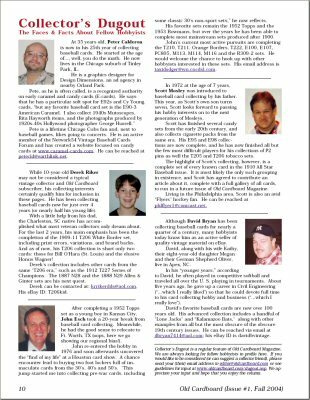 Collector's Dugout is a regular section of Old Cardboard Magazine in which we provide brief profiles of subscribers along with a small photo (see example at right). We are always looking for fellow hobbyists to profile in this section. If you would like to be considered (or can suggest a collector friend), please send us an email with the information requested below, along with an attached image file. We look forward to receiving your input and including your profile in a future issue of the magazine. Each profile is very brief (roughly 150-200 words) with content as shown below, and runs along with a color photo (headshot) of the subject of the profile. Core data: Photo, name, city and state where you live, and most importantly, an overview of your key collecting interests. We will also run your email address so that people can contact you if they have similar interests, etc. Other types of information you might want to consider (optional and used as space permits): Forum/Club Memberships (OBC, SABR, etc. ), Website URL, Articles Published, eBay ID, etc. The color photo will be cropped to a "headshot" that will print in the magazine about 1 inch wide by 1-1/4 inches high. We can do all of the photo cropping and image processing if you send a color image in digital format (.jpg preferred) so that after cropping it will be about 300 pixels wide by 400 pixels high. If we need to crop from a larger view, the overall resolution will need to be proportionately higher. We will also be happy to scan the image ourselves if you send us a color photograph in just about any size. If you have any questions, please contact us at editor@oldcardboard.com.